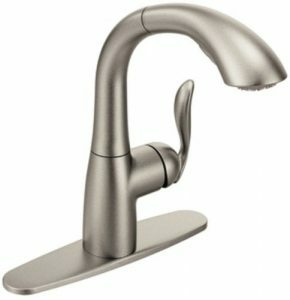 Choosing the best kitchen faucet can be rather complicated. This plumbing fixture can contribute to the kitchen design favorably as well as break it completely. The finish is not the only option which can influence your space. There is a variety of forms and designs – classic, province, contemporary, high-tech and all of them give a touch of originality to your kitchen. Check the list of TOP rated faucets 2018 below to choose the most appropriate for your needs. 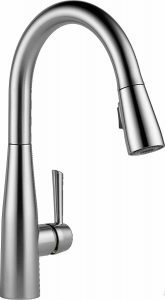 The Delta Leland 9178-AR-DST is one of the best-designed taps, available in three finishes – chrome, arctic stainless and Venetian bronze. Its design is sleek and elegant and will match both classic and contemporary kitchens. 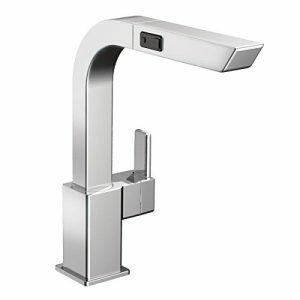 The special feature of this faucet is integrated magnet of the docking system. It is extremely durable, will never wear out and works smoothly when you attach or detach a spray wand. 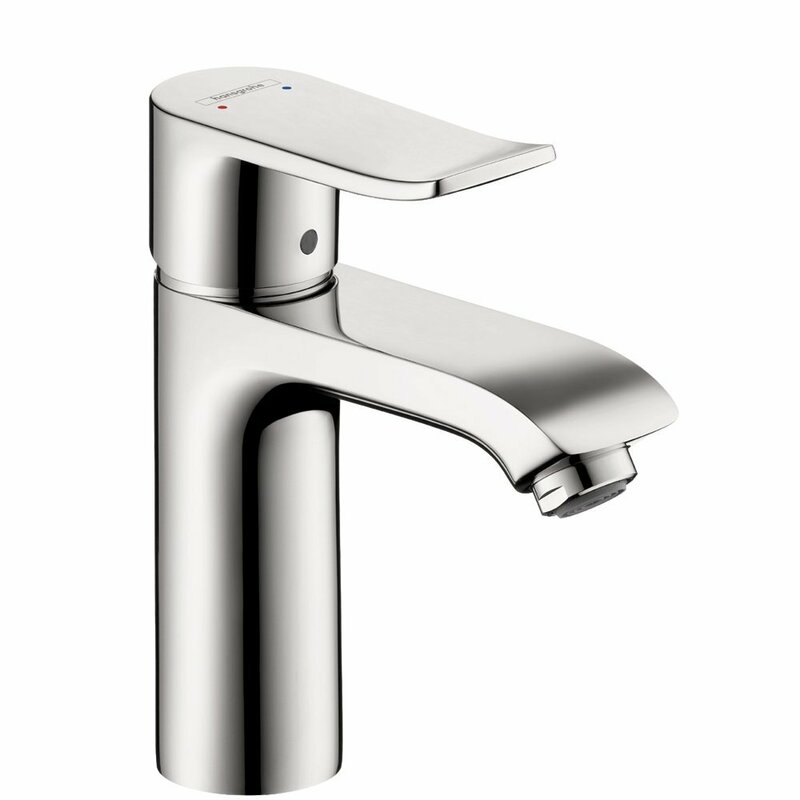 In addition, Delta diamond seal technology is a unique innovation, which ensures the faucet’s long lifespan. In case the water is hard, you shouldn’t worry about build-up, as rubber holes of a spray head are very easy to clean and maintain. The faucet capacity is 1,8 gpm, which conserves water offering a good density flow at the same time. An indicator on the spout base changes color depending on the temperature to prevent scald. The American Standard Colony 4175.300.075 model offers a number of perfect features, which naturally affect its price. The finishes available are: stainless steel, matte black and polished chrome. Majority of buyers emphasize a powerful look of matte black finish, which is corrosion, scratch and tarnish resistant like all the other finishes. A ceramic disc valve is a guarantee of a smooth reliable operation without leaking. Furthermore, a valve has a memory feature, which allows you to choose a temperature once and not adjust it afterwards. The spout is equipped with a 20-inches flexible hose providing 2,2 gpm flow rate. The sprayer was tested for 1 million cycles proving that the system is really robust and durable. This faucet is also equipped with a pause button for better water conserving features. The installation is quite simple, most consumers do it themselves with minimum tools and efforts. 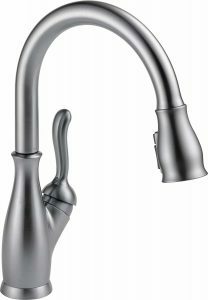 American Standard gives a lifetime warranty to this faucet. 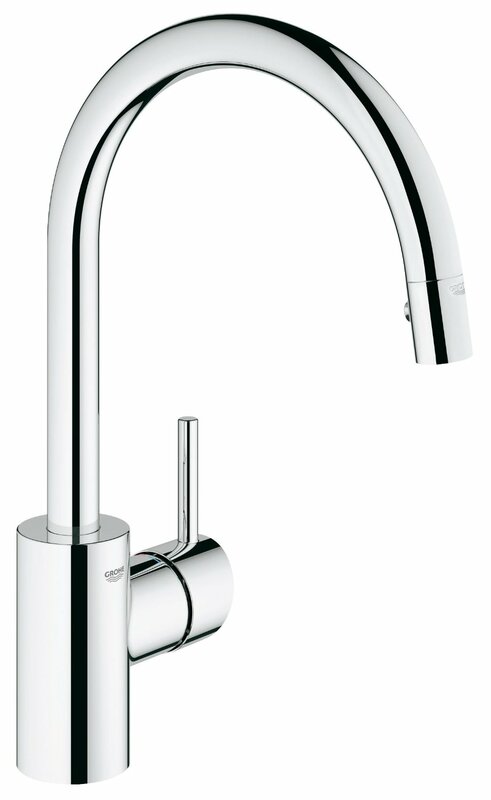 The Kraus KPF-1602 is a premium faucet which comes in two finishes – stainless steel and chrome. The construction is lead-free while the finish is corrosion and scratch resistant. This faucet has a commercial-like design, which reminds of a restaurant dishwasher. A single lever is very easy to operate meantime two-way diverter adds a high level of comfort when use. Another luxurious feature is a side pot filler included. The spout swivels allowing great access to the sink to wash even large pots. Rubber nozzles on the spray head are very easy to clean with a simple brush. The Neoperl aerator gives a perfect performance to homes with poor water flow. The Hungarian Kerox ceramic cartridge guarantees reliability and leaking absence. All the mounting tools are included in a package saving you from an extra trip to the store. There is a number of certification approval stamps on this faucet including CALGreen, UPC and FTC. 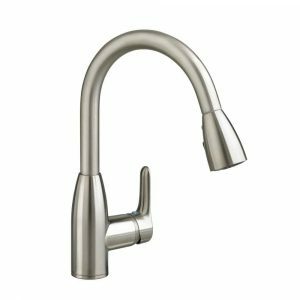 The Decor Star TPC11-TO faucet is available in brushed nickel, chrome and oil rubbed bronze finish. The customers report about the outstanding look of oil rubbed bronze tap. This finish is the most popular with this model. The extended base allows the spout to swivel from a higher point than other models giving you much more working space in your washbasin. The ergonomic buttons offer a quick switching between two modes – spray and stream. The sprayer can be extended for 26 inches and is very comfortable for all the manipulations around the basin. The counterweight makes the hose slide back into the faucet without any effort. Concerning the flow rate – it is rather powerful – about 1.8 gpm. Note! The Décor Star is ADA and lead-free standards compliant. The Delta 9113-AR-DST Essa with its simple and sophisticated design is a perfect choice for modern kitchens. It is a very practical fitting, easy to maintain and built to last. Delta Essa 9113-AR-DST is designed with a number of finishes – arctic stainless, champagne bronze, chrome and matte black. The faucet requires 1 or 3 hole installation and all the fittings are included. The high spot swivels 360° for a better maneuverability. The pull-down sprayer is equipped with MagnaTite Docking system which snaps a wand precisely into place. The hose has a 20-inch reach giving a perfect range to clean everything around. The wand has a special wipe-clean surface which is also used on Delta’s shower heads. Such surface saves a faucet from hard deposits adhesion. The Delta diamond system is manufactured to keep the tap leak-free for more than 5 million uses. The layer of diamonds prevents the valve from wearing. The Delta 9159-AR-DST Trinsic has 4,2 star rating on Amazon due to its simplicity and several high end upgrades. Like Essa model, the Delta Trinsic is also available in four colors: chrome, arctic stainless, champagne bronze and matte black. The firm bold lines give the impression of durability and heaviness, which is a complete truth. 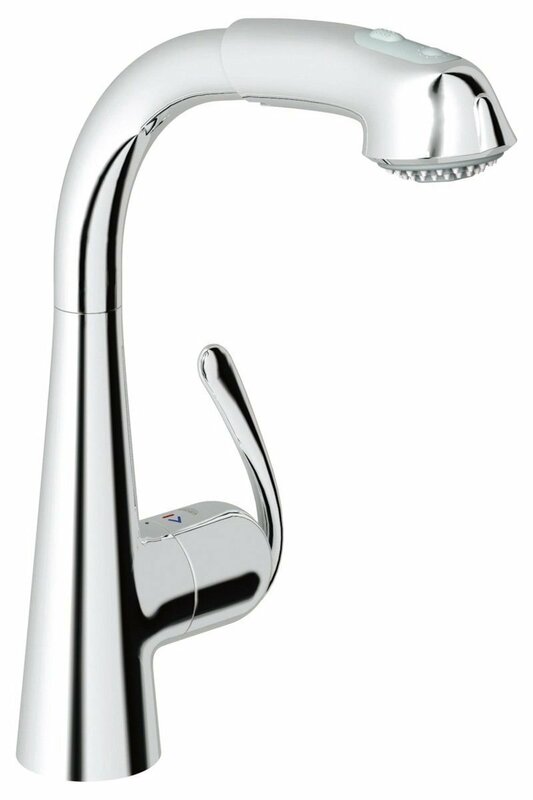 The faucet weighs 7 pounds, it is made of high quality solid metal. The model is equipped with MagnaTite Docking and Diamond Seal technologies which guarantee long time of ideal performance. The faucet is ADA compliant and meets all CALGreen standards with water flow capacity of 1.8 gpm. The calcium can be easily moved away due to a touch-clean technology of Delta. A unique elegant shape of this faucet makes it look more expensive than it really is. The product is improved according to customer’s feedback. You will never experience leaking with this tap. The arch construction is lead-free and is manufactured of a solid brass with a ceramic valve. Thus, the faucet is corrosion resistant and will serve you for decades. 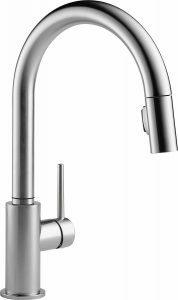 The extended base lets the spout swivel 360° making your sink area more convenient. The sprayer has two modes – aerated stream and a powerful cleaning spray and its hose is nylon braided for durability. The model requires one hole installation. All the necessary water hoses and standard hardware are included. Avola gives a five year warranty for this product. Brushed nickel and oil rubbed bronze finishes are available. 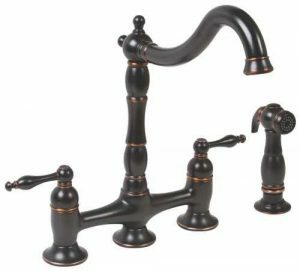 The Premier Charlestown 110702 is a sophisticated faucet for classic, Victorian and province-styled kitchens. Its bronze finish looks very special emphasizing all its recesses and embellishments. The faucet is two-handled and its waterway bridge pieces resemble old-fashioned pipes and tubes. The Charlestown 110702 is very sturdy. It is all made of metal except the ceramic valve. 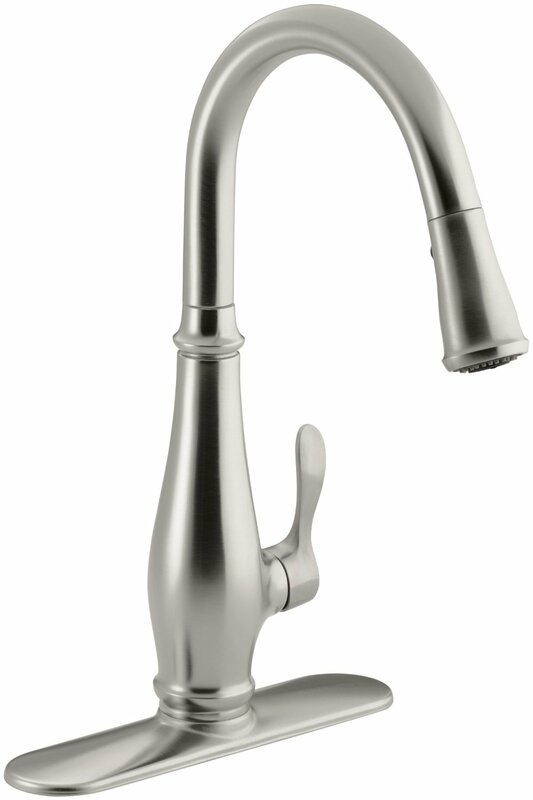 The spout rises 11 inches above the sink providing much place for your manipulations. It is able to provide powerful stream for dishwashing with 2,2 gpm and meets the EPA’s standard benchmark. A side sprayer repeats the faucet’s design and is easy to install. In spite such unique design, the model can be used by disabled people. 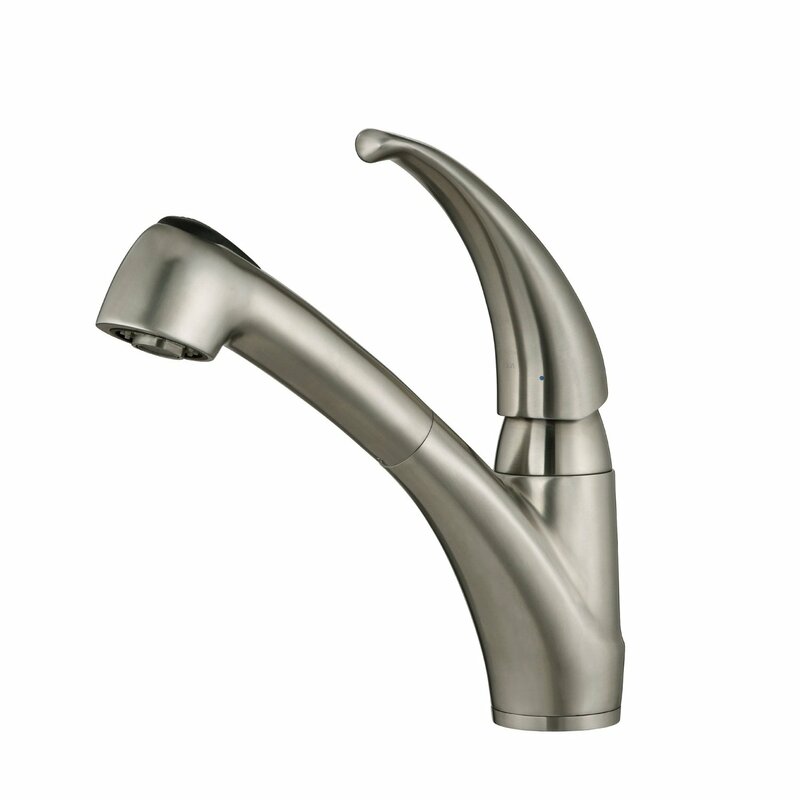 All Moen faucets have their specific and recognizable design. 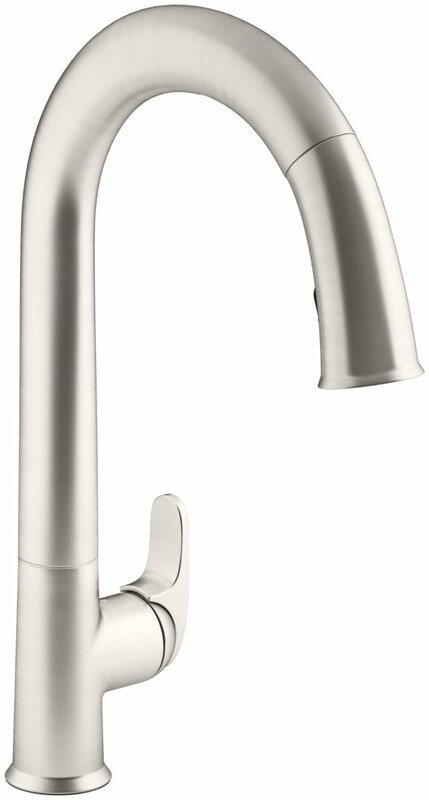 The spout of the Moen 7294SRS Arbor is delicately curved so that the water tap can match diverse decorative designs. Your kitchen basin will look clean and attractive as the faucet finishing is spot and fingerprints resistant. The sprayer hose is long and can be moved in any direction you wish. The high arch spout allows to fill in or clean large pots. There is also a pause button for water conservation and filling containers outside the sink. The 360° rotation gives a possibility to install the handle on the other side. 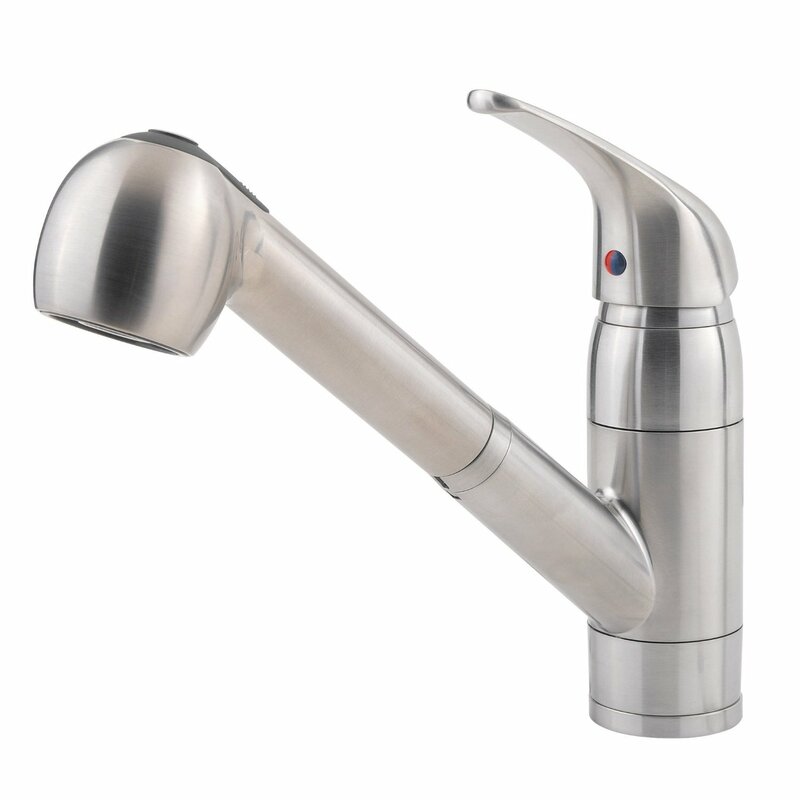 The faucet can operate as a stream or as a spray with water flow power of 1,5 gpm. The hose is ultra flexible and the sprayer head moves exceptionally easy. It returns back into the spout without any assistance. 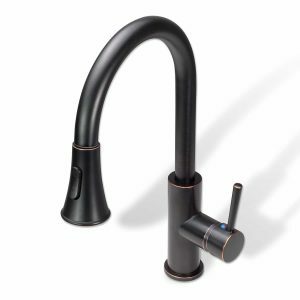 The faucet is available in oil rubbed bronze, matte black and spot resistant stainless finish. The Kraus KPF-1622SN is a middle-priced model, available in chrome and satin nickel finishing manufactured of a lead-free metal. 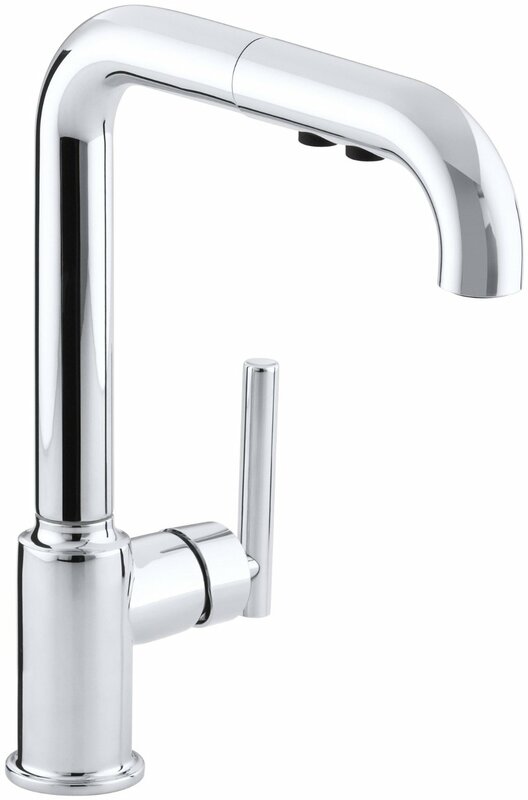 The high base of this tap lets the spout swivel at a higher point than other models. Thus there is much more space for dishwashing in your sink. The counterweight makes the sprayer dock back into the spout when it is not in use. The imported Neoperl aerator makes Kraus KPF-1622SN water conserving even in homes with powerful water pressure. The Hungarian cartridges prevent leaking and operate smoothly. The installation of this tap is a breeze for the consumers as only minimum tools and efforts are required for a single plug mount. 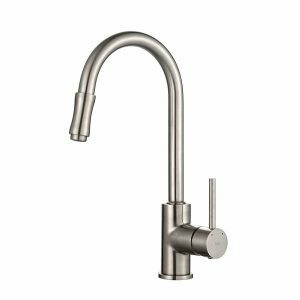 The Moen S7597C is extremely stylish. Its high-tech look incorporates originality and durability and will improve your modern kitchen. It is made of heavy brass (about 7 pounds) with a bright chrome finish. 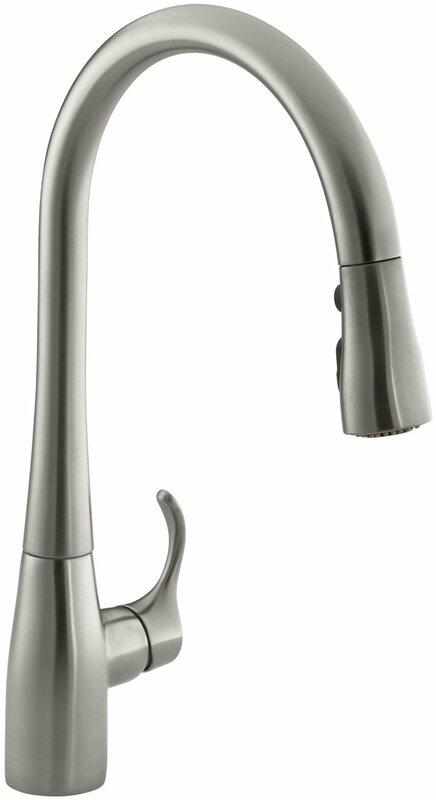 The sharp-edged spout is equipped with a reflex pull-down system. A 59-inch braided hose is a real gift for every kitchen owner. Hydra-lock system ensures hassle-free installation without tools and a plumber. The water flow delivery is only 1,5 gpm which means that you will save water. Moen gives a lifetime warranty for this model. The faucet matches kitchens with minimalist high-tech and contemporary styles. Does a faucet match your kitchen accessories and design? Does it fit your counter or sink? Is it convenient for your family? What kind of warranty a manufacturer gives? The configuration means the way according to which the faucet’s pipework is laid. If the configuration is wrong, you might have to make additional holes in your sink, or on the contrary – some spare holes can appear. Of course, you can always buy special panels to cover holes, but it is better to choose correct configuration from the very beginning. The right faucet can complement the design of a kitchen space perfectly. 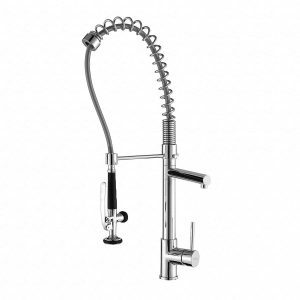 Besides, the tap’s design is no less important and is closely connected with the functionality and operation features. Faucets with high spouts allow you to place large pots and pans into the sink. The spray hose is perfect to reach containers and appliances which can’t fit in the basin properly. A swivelling spout can be moved away if you need much place and is excellent for dual sinks. 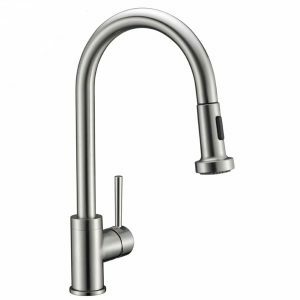 If your kitchen is contemporary-styled, you can choose a wall-mounted faucet. The plumbing pipes in this case are concealed behind the wall finish. This technology is very convenient, but requires wall reconstruction. There are various finishes to choose when you are looking for the faucet you like. Polished brass – is the most popular color. It has a timeless look, very durable and easy to maintain. It is also one of the most high-priced finishes. Satin brass – looks a bit softer. Its surface is matte, so you will not have any troubles with fingerprints or water spots. This finish is quite rare, not every manufacturer has it available. Oil rubbed bronze – is also a great finish to choose, although it matches not every design. Such faucets are rather expensive too. Polished nickel – is a bit darker than chrome, but both finishes give a touch of elegancy at a low cost. These colors are easy to match with contemporary and high-tech styles. 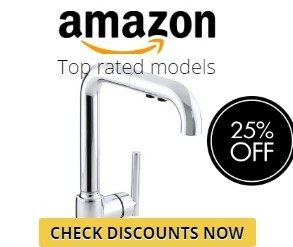 The faucet of a good reputable brand will not be cheap. Of course, there are some less expensive models, their price depends on the quantity of their extra features, but not on their quality. Even if something happens to your faucet, a manufacturer covers all the costs according to the warranty available. No name brands offer a short warranty period and their plumbing fixtures contain plastic innards, which are not durable and break regularly. So, if you wish a hassle-free faucet, choose a good brand. Even if your budget is rather frugal, choose a simple model but of a good reliable manufacturer, with a lifetime warranty and a local service centre. An ordinary kitchen faucet consumes about 30% of water in a household. That is why it is necessary to choose a good tap to prevent leaking. The leaks are usually caused by bad or old installations, broken or cheap innards. A steady leak can waste 3000 gallons of water per year. A good faucet can seem to cost much, but as a result it will save your money many times. The faucets with water aerators are a perfect know-how which conserves water effectively. A smooth lever control will quickly adjust the temperature and water flow, thereby conserving water and your budget. Pause buttons are very convenient to use when you have to step away from you basin for a couple of seconds. We still remember those old faucets, which took much space, couldn’t be moved and had no features except one water flow mode. Fortunately, today we have a rich choice of plumbing fixtures designed to make our lives easier and more convenient. Most faucets have built-in hoses with sprayer, the so-called 2 in 1 systems. You just pull down the wand and retract a long hose to wash a big pot or something outside the sink. The hose slides back due to a magnetic system as soon as you leave it. Such system is very popular today and even low-priced models are equipped with it. The faucet cartridges or valves regulate water flow and control the temperature. They are tied together and can be repaired or replaced if broken. A leaking tap is usually the cause of a damaged valve. The good brands make durable ceramic cartridges which have a long lifespan and are extremely durable. There are some faucet valves which are very easy to replace by unclicking a button on the side of the tap. The other models are more complicated and require a plumber. One of the first features in the list is certainly MotionSense. This technology allows you to turn on and off the faucet and to change the temperature without touching the faucet. But some kitchen owners are disappointed with this feature. The kids usually play with the tap wasting water and draining the batteries. So, if you do not have backup batteries at hand, you can leave without a kitchen faucet for some time. “Green” kitchen faucets are really convenient and environment friendly. But they do not filter out all the harmful minerals from water. Many people should buy additional water purification systems. It would be great if the manufacturers include purification devices into the faucets in the initial step. If you have no experience in plumbing installation, the manufacturers strongly recommend to call on a professional. If some parts of a faucet are broken during the set-up process, no warranty will cover this case. And it will be extremely unpleasant to spend extra money for the new details most likely more expensive than a plumber’s visit. There is no doubt, that it is better to purchase a good faucet and enjoy its performance for decades. Maybe it might cost a bit more than you suppose to spend, but keep in mind that you buy a thing which brings comfort to you home, saving water, your money and time.